Boston: Houghton Mifflin Company, 1976. Fine/Near Fine. First edition. Fine in near fine dustwrapper with some foxing confined mostly to the inside of the jacket and a small, internally repaired tear on the front panel. Inscribed by Conroy to the daughter of poet James Dickey, who was one of Conroy's major early influences, and with whom he studied: "To Patsy, Thanks for the kindness, your encouragement, your enthusiasm, your letters, and your friendship. Pat Conroy. May 3, 1980." The author's splendid first novel, basis for the excellent film with Robert Duvall in the title role. Increasingly scarce first edition with a very nice South Carolina-association. Boston: Houghton Mifflin,, 1976.. Uncorrected proof.. 536 pp. Very near fine in printed wrappers. An uncommon proof. 'With the Compliments of Houghton Mifflin' card laid in. Conroy's third book, basis for the successful film. Boston: Houghton Mifflin, 1976 Signed by Conroy on title page. Top edge grey, minor wear bottom edges causing slight loss of color, bottom corner lightly bumped. DJ has slight wear top of backstrip.. Signed by Author. First Edition. Cloth. Almost Fine/Almost Fine. 8vo - over 7¾" - 9¾" tall. Modern Literature. New York: Houghton Mifflin, 1976. Inscribed to...Here's to teaching, Pat Conroy a few foxing spots to the bottom edge of the textblock esle a fine copy. Inscribed By the Author. First Edition. Hardback. Near Fine/Fine. Hardcover. Boston: Houghton, Mifflin, 1976. First Edition. First Edition. SIGNED by the author on the title page. Fine and unread in a Near Fine dust jacket. Jacket is extremely bright and clean, with a shallow crease at the heel and some foxing to the verso, and just a hint of foxing to the page fore-edges. 1976-05-03. New. Ships with Tracking Number! INTERNATIONAL WORLDWIDE Shipping available. Buy with confidence, excellent customer service! BOSTON: HOUGHTON MIFFLIN CO. FINE IN NEAR FINE DUST JACKET. PUB 1976. FIRST EDITION. HARDCOVER. ISBN: FIRST PRINTING WITH FULL NUMBER-LINE INCLUDING "1" ON COPYRIGHT PAGE. ISBN: AND "1976" ON TITLE PAGE. BOOK IS FINE WITHOUT ANY MARKS TO THE BINDING OR THE TEXT OTHER THAN ASMALL RED DOT ON THE BOTTOM EDGE. D.J. IS ABOUT FINE WITH A SHORT TEARAT THE BOTTOM FRONT SPINE CORNER AND ONE AT THE TOP OF THE REAR PANEL,AND IS NOT PRICE-CLIPPED. A BEAUTIFUL CLEAN, BRIGHT, UNFADED COPY..
Boston: Houghton Mifflin, 1976. Orange cloth with black spine lettering and top edge dark stained. Signed by Pat Conroy on half title. Pictorial dust jacket not price clipped, Copyright page with "c" followed by descending numbers 10 to 1. Orange cloth with black spine lettering and gray stain on top edge. Copyright page with letter "c" followed in descending order by 10 to 1. Unpriceclipped pictorial dust jacket with code 0576 has random minor staining but is without chips or tears. Remarkable story of the Conroy family as run by the father Marine aviator Donald Conroy. . Author. First Edtion. Cloth. Near Fine/Good. 8vo - over 7¾" - 9¾" tall. Trade. 1989-01-09. New. Ships with Tracking Number! INTERNATIONAL WORLDWIDE Shipping available. Buy with confidence, excellent customer service! Houghton Mifflin, 1976. Book. Fine. Hardcover. 1st Edition. 8vo - over 7¾ - 9¾" tall. Perfect Fine Copy in Like Jacket First Edition/First Printing $10.00 on Flap.Small Red Dot Excellent Fresh Copy of His Great Novel Rare In This Condition.Beautiful Copy..
Old New York Book Shop Press. Hardcover. 0937036005 New Condition. . New. Old New York Book Shop Press. Hardcover. 0937036005 Like New Condition. . Fine. Boston: Houghton Mifflin Company, 1976. 536 pages. Pages clean, v/g condition. Previous owner's name on Half Title page and on last page of text. Black endpapers spotless. Orange cloth, black title on spine. Dust jacket price clipped. DJ illustrated in cover on upper cover and b/w photograph on lower cover. VG+/VG+. 1st Edition. Hard Cover. Very Good+/Very Good+. Boston: Houghton Mifflin Company, 1976. Fine/Near Fine. Second printing. Small embossed owner's stamp of film and theatre actress Mimi Cozzens on the front fly, else fine in near fine, price-clipped dustwrapper. Nicely Inscribed by the author" "To Mimi Cozzens, Who has excellent taste in men and professions. The author's splendid first novel, basis for the excellent film with Robert Duvall in the title role. Boston: Houghton Mifflin, 1976. Illustrated by Wendell Minor jacket. First (SD & N1) edition. Third book. Orange/red cloth, black eps and topstain. Demy 8vo. pp. 536. Near Fine/Very Good (0576)/Unclipped price ($10.00) in mylar. Minor wear to binding in bright jacket with closed tear in front which has old foxed tape residue from back, light edge wear and spots of foxed stain on spine..
OLD NEW YORK, 1990. A FINE FIRST IN DJ. SIGNED.. Signed. FIRST. Fine/Fine. Boston. : Houghton Mifflin. , 1976 . 1st Edition.. Red cloth, black spine title, top edge stained gray. . Fine in a near fine dust jacket. . 22x15 cm. . Signed by the author on the title page. Condition: Fine in a near fine dust jacket. Boston: Houghton Mifflin, 1976. First Edition. Hardcover. Near Fine/near fine. ,. Novel of a Marine Corps family, made into film starring Robert Duval. First printing. Orange cloth boards slightly faded at top and bottom of spine. Dust jacket with price intact on flap and has a 1/8" tear and tiny creases at top of spine. Atlanta: Old New York Book Shop Press. Fine in Fine dust jacket. 2004. Reprint; Signed by Author. Cloth. 0937036005 . The 2004 reprint edition in crisp, fine condition in alike dust jacket. Signed by author Pat Conroy on the title page; Pat Conroy's first novel is the look into the family life of a fighter pilot. Bull Meecham is the epitome of the Marine officer  as tough a disciplinarian at home as at the base. Rebellion, or even difference of opinion, is not tolerated. Objections are met with the statement "The Great Santini has spoken." As the oldest child, Ben takes the brunt of his father's criticism. His attempts to stand up for himself or his mother and sister are contemptuously dismissed. His feelings for his father are a mixture of hate and fear, reluctant pride in his prowess, and unacknowledged love. - from the dust jacket . Houghton Mifflin, 1976. First Edition, 1st Printing. Hardcover. . Excellent condition./1 very small mark at edge else very good dust jacket. . Price clipped. Inscribed by author - To Renee, From Ted who also has a complex family, Pat Conroy. Book is as described - all defects and marks are noted. A very nice copy. London - Collins, 1977 Book. Hardcover. 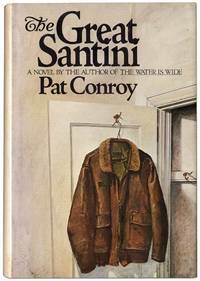 First edition.. A smart first edition of Pat Conroy's semi-autobiographical novel The Great Santini. Featuring the original illustrated dustwrapper. The novel explores main character Ben Meecham's growth into manhood, his experiences playing basketball for his high school, as well as his friendships with a Jewish classmate and an African-American farmer. The novel exposes the love-hate relationship between Ben and his father, and the lengths Ben goes to in an effort to win his father's acceptance and love. Condition: In original cloth binding with original unclipped dustwrapper. Externally,cloth is generally smart, with some very minor rubbing and marks tothe spine. Dustwrapper is sound with only some sunning. Internally, firmly bound, bright and clean throughout. Overall: FINEwith a FINE dustwrapper..
Boston: Houghton Mifflin Company, 1976. First edition. Hardcover. Very Good +/very good +. First Edition with complete number line on copyright page. Tight binding. No chips, tears, creases or written inscriptions on pages. Dust jacket is clean and bright and is price-clipped. Light edgewear to dust jacket with a couple of small tears less than 0.5" in length. Size: 8vo (8" to 9"). 536 pp. Houghton Mifflin, 1976-04-05. Hardcover. VeryGood. 8.4000 inches 5.9000 inches. First edition with full numberline. Inscribed and signed by the author on the title page. Dust Jacket is price-clipped and in a removable, clear plastic (Brodart) protector, shows minor wear and tear. Pages are clean. Atlanta, GA: Old New York Book Shop Press. Fine in Near Fine dust jacket. 1989. Hardcover. 0937036005 . Hardcover with dustjacket, this high-quality reprint of the author's first novel is signed by the author on the title page, book is in excellent condition, no remarkable flaws, jacket is also in great shape, two tiny edge-nicks is the only flaw, the original price is present and a professional (removable) mylar cover is included; ; 536 pages; Signed by Author . London - Collins, 1977 Book. VERY GOOD INDEED. Hardcover. The first UKedition of this popular tale of life in the Marines from Pat Conroy. The novel is based on Conroy's own childhood experiences growing up in a military family. Conroy's own father, Donald Conroy, was the inspiration for Bull Meecham. Condition: In a navy cloth binding with original unclipped dustwrapper. Externally, smart, with just some slight shelfwear. Dustwrapper is quite smart, with just some slight edgewear, and sunning to the spine. Internally, firmly bound. Ink signature to front free-endpaper. Pages are bright and clean, with just a few instances of foxing. Overall: VERY GOOD INDEED in aNEAR FINEdustwrapper..
1982-07-01. New. Ships with Tracking Number! INTERNATIONAL WORLDWIDE Shipping available. Buy with confidence, excellent customer service! Atlanta: Old New York Book Shop Press. Near Fine in Near Fine dust jacket. 1989. Reprint; Signed by Author. 1/4 Cloth. 0937036005 . A Reprint edition in Near Fine condition with slight corner bumping, housed in an alike dust-jacket that features little soiling. The volume is signed and inscribed by author Pat Conroy on the title page; Pat Conroy's first novel is the look into the family life of a fighter pilot. Bull Meecham is the epitome of the Marine officer  as tough a disciplinarian at home as at the base. Rebellion, or even difference of opinion, is not tolerated. Objections are met with the statement "The Great Santini has spoken." As the oldest child, Ben takes the brunt of his father's criticism. His attempts to stand up for himself or his mother and sister are contemptuously dismissed. His feelings for his father are a mixture of hate and fear, reluctant pride in his prowess, and unacknowledged love. - from the dust jacket . Atlanta, Ga: Old New York Book Shop Press. Hardcover. signed by pat conroy on the front free fly. . Fine. 1989. Reprint Edition. London - Collins, 1977 Book. NEAR FINE in a V. Hardcover. The first UKedition of this popular tale of life in the Marines from Pat Conroy. The novel is based on Conroy's own childhood experiences growing up in a military family. Conroy's own father, Donald Conroy, was the inspiration for Bull Meecham. Condition: In a navy cloth binding with original unclipped dustwrapper. Externally, smart, with just some bumping. Dustwrapper is quite smart, though with a couple of chips and small closed tears, and some sunning to the spine. Internally, firmly bound. Pages are bright and clean, with just the occasional handing mark, and some creasing to the lower fore-edge. Overall: NEAR FINE in a VERY GOOD INDEED dustwrapper..
Houghton Mifflin, 1976-04-05. Hardcover. Used:Good. Boston: Houghton Mifflin, 1976. Inscribed 'to --- ---- '58 Here's to a Citadel man Pat Conroy 67.' The dates of their graduation from the Citaldel I assume. Second printing. Tiny tears at head of jacket spine. . Inscribed By Author. Second Printing. Hard Cover. Very Good+/Very Good+. 2013-11-26. Good. Ships with Tracking Number! INTERNATIONAL WORLDWIDE Shipping available. May not contain Access Codes or Supplements. May be ex-library. Shipping & Handling by region. Buy with confidence, excellent customer service! 2013-11-26. New. Ships with Tracking Number! INTERNATIONAL WORLDWIDE Shipping available. Buy with confidence, excellent customer service! 1987-01-08. New. Ships with Tracking Number! INTERNATIONAL WORLDWIDE Shipping available. Buy with confidence, excellent customer service! London - Collins, 1977 Book. VERY GOOD INDEED. Hardcover. The first UKedition of this popular tale of life in the Marines from Pat Conroy. The novel is based on Conroy's own childhood experiences growing up in a military family. Conroy's own father, Donald Conroy, was the inspiration for Bull Meecham. Condition: In a navy cloth binding with original unclipped dustwrapper. Externally, smart, with just some slight shelfwear to the extremities. Dustwrapper is quite smart, with just some slight edgewear (including a couple of chips, sunning to the spine, and a few spots. Internally, firmly bound. Coloured pencil signatures to front pastedown and endpaper. Pages are bright and clean, with just the odd spot. Overall: VERY GOOD INDEED in a VERY GOOD INDEED dustwrapper..
2008-06-09. Good. Ships with Tracking Number! INTERNATIONAL WORLDWIDE Shipping available. May not contain Access Codes or Supplements. May be ex-library. Shipping & Handling by region. Buy with confidence, excellent customer service! 2013-07-01. New. Ships with Tracking Number! INTERNATIONAL WORLDWIDE Shipping available. Buy with confidence, excellent customer service! 2013-07-01. Good. Ships with Tracking Number! INTERNATIONAL WORLDWIDE Shipping available. May not contain Access Codes or Supplements. May be ex-library. Shipping & Handling by region. Buy with confidence, excellent customer service! 2002-03-01. New. Ships with Tracking Number! INTERNATIONAL WORLDWIDE Shipping available. Buy with confidence, excellent customer service! 1995-08-01. Good. Ships with Tracking Number! INTERNATIONAL WORLDWIDE Shipping available. May not contain Access Codes or Supplements. May be ex-library. Shipping & Handling by region. Buy with confidence, excellent customer service! Old New York Book Shop Press, 1989-01-01. Hardcover. Used:Good. 1987-12-01. Good. Ships with Tracking Number! INTERNATIONAL WORLDWIDE Shipping available. May not contain Access Codes or Supplements. May be ex-library. Shipping & Handling by region. Buy with confidence, excellent customer service! Houghton Mifflin, 1976 Tight, square binding. Clean text and interior. Light rubbing and chipping to unclipped dust jacket, now wrapped in protective mylar. Blue top stain. Orange cloth with black title on spine. Boston, MA: Houghton Mifflin Company, 1976. First Edition. Hardcover. Very Good/Very Good. First Edition. Orange cloth with black spine lettering. Textured end papers. Mylar cover. Half title page reads, "Property of The Golden Eagle, Stowe, VT" Dust jacket is price-clipped. 536pp. Full refund if not satisfied.